Have you ever noticed that your cabinets appear dingy and lackluster? Are your cabinets a few years old, but look much older? Grease, oil, and dirt can build up on your cabinets overtime. This can make your cabinets look older than they actually are. If this happens to be the case, it’s time to roll up the sleeves for some cabinet care. Download the “Cabinet Care 101” eBook for helpful tips and tricks. Taking care of your cabinets can help protect your investment. The “Cabinet Care 101” eBooks covers three areas. The How to Clean Your Cabinets section covers everything for cleaning your cabinets. You’ll learn how to dust and clean as well as maintaining your glass doors. We also give our recommendations on products to avoid. We explain what you need to know in the How to Care for Your Cabinets section. We’ll inform you on the pitfalls of appliances with a self-cleaning function. Learn about some of the dangers of heat-producing appliances. Ultraviolet rays can damage your cabinets. Learn what you can do to help prevent that. The Cabinet Maintenance sections covers fixing the wear and tear your cabinet faces. Learn what we can do to help with touch-ups. Cabinetry hardware can wear down over time. Master how to adjust hinges. Study up on how to adjust your soft close pistons on your glides. We know you’ll find the “Cabinet Care 101” eBook is a helpful guide. The idea is to help make your cabinets look great and last longer. If you happen to have any tricks and tips of your own, feel free to email them to customercare@choicecabinet.com. 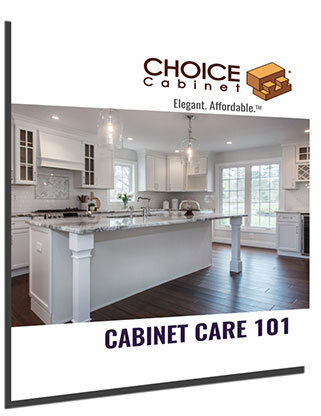 Download the “Cabinet Care 101” eBook. Provide us a little information about yourself. Finally, click “Submit”. We’ll redirect you to our download page! Please read carefully BEFORE filling out bottom portion.